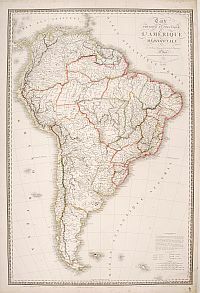 82 VAN LINSCHOTEN, J. H. Delineatio omnium...[South America] Amsterdam, ca. 1596. Good impression. Paper slightly age-toned, margins cut short as issued, lower left part cut into the scale (4 mm). 390 x 550 mm. 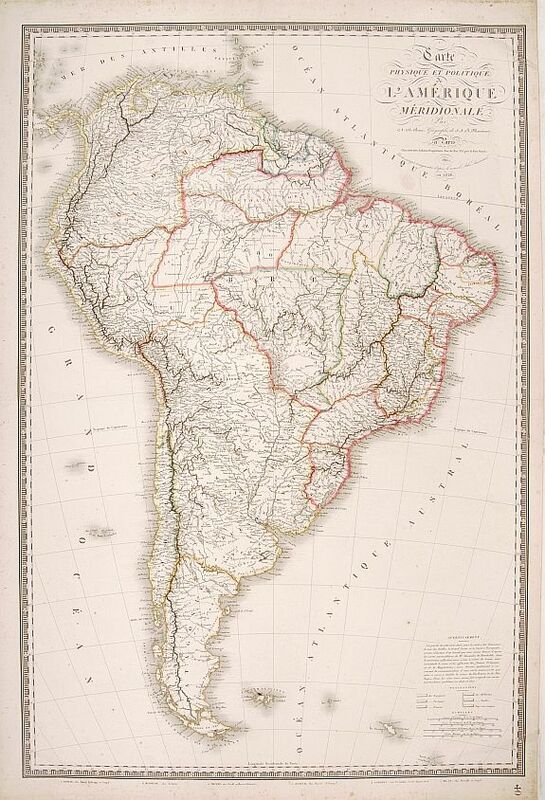 � A highly decorative and distinctive map showing south America, superbly engraved by Arnold van Langeren. On the middle of the map, animals and scenes of cannibalism are depicted. Two very fine cartouches on both opposite corners. Map oriented with west at the top. 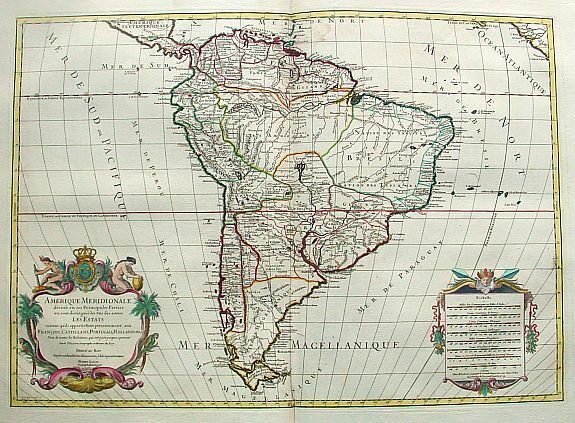 The map extends from Florida to Tierra del Fuego with north oriented to the right of the page. Extremely detailed, particularly around the coasts, this map is one of the most lush examples of Dutch decorative engraving. It boasts vignettes of Brazilian cannibals, Patagonian giants, long eared dogs, and a fabulous lion-like creature, reported by Brazilian natives to be able to live without eating or drinking. There are two elaborate title cartouches and the surrounding seas are filled with monsters and galleons. 83 SANSON, N. / JAILLOT, H. Am�rique M�ridionale divis�e en ses Principales Parties� Paris, 1719. Limites en col. d'�poque. Bel exemplaire. Cartouche et �chelle col. - A good and dark impression. 480 x 645 mm. � Grav� par Cordier. - A very impressive large scale map. The large decorative title cartouche is balanced by an equally large cartouche around the scale bars, surrounded by Indian figures and wildlife. 84 LOTTER, T. C. America Meridionalis. 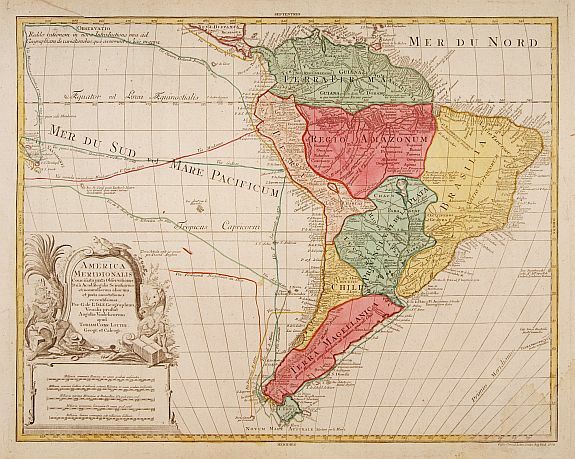 Augsbourg, 1772. Beau col. ancien. With an uncoloured title cartouche. Good condition. 460 x 580 mm. 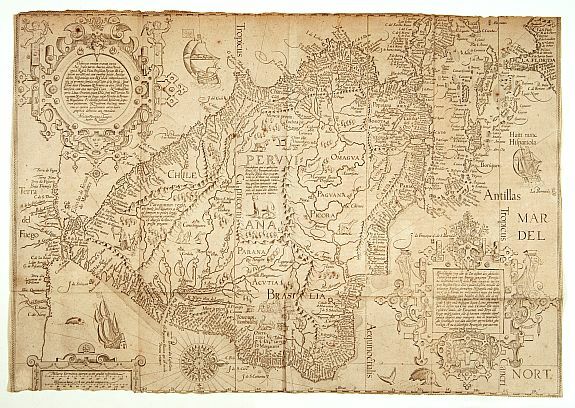 � A handsome detailed map with a large title piece at bottom left is surrounded by natives, a bird and a elephant. 85 BRUE, A. H. Carte Physique et Politique de l'Am�rique M�ridionale. Paris, 1826. Limites en col. ancien. Bel exemplaire. 860 x 575 mm. � Les limites colori�es indiquent les diff�rentes possessions : Espagnols, Portugais, Fran�ais, Hollandais, Anglais et Pays non conquis. 88 AQUARELLE ANONYME. Rio de Janeiro. 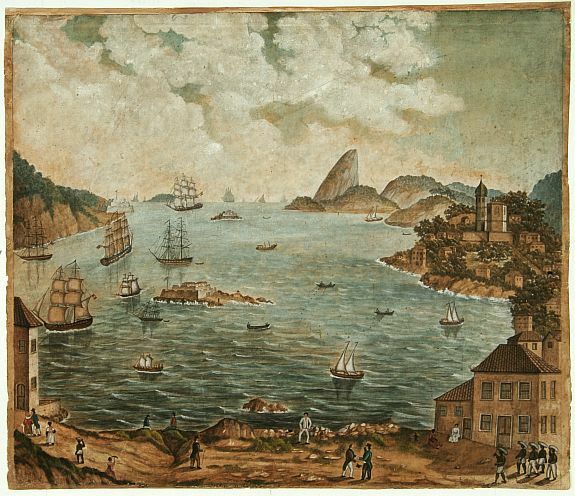 Rio de Janeiro ?, ca. 1830. Col. ancien. Papier l�g�rement bruni, infimes rousseurs. Bon �tat. - Paper slightly age-toned, some brown spotting. 425 x 490 mm.